(Insider Secrets) How to Tell if your Diamond is Fake? Anyone buying or selling diamonds will usually think about this question. At first glance, it may seem impossible to distinguish between a real diamond and a fake diamond. There are, however, tips and tricks that will help you. In this article, you will learn how to tell if a diamond is real or not! It is important to remember that even with our advice, it will still be difficult to establish if it’s a gemstone or piece of glass. Even professionals will sometimes be unsure if a particular diamond is fake or real. If you ever buy a diamond, or any piece of jewelry which contains a diamond, only do so if it is accompanied by a certificate from a recognized appraisal organization. Make sure that the diamond that you are buying actually matches the one on the certificate provided. If you have doubts, or if the diamond is being offered cheaply and with no certificate, walk away. This advice won’t help you if you already have the diamond, but it’s still noteworthy to mention. So what if you’ve inherited the diamond or already have it in a ring for which you don’t have a certificate? What do you do then? The fake-diamonds that are usually used in fashion jewelry are Moissanite or Cubic Zirconia (CZ). Both are nominally natural materials. Moissanite was first discovered in a fallen meteor by Henri Moissan in 1893. Cubic Zirconia was discovered in 1892 and it was initially used as a refractory material before being realized as a diamond substitute. All Moissanite and Cubic Zirconia commercially-produced today is synthetic due to the lack of natural material available. 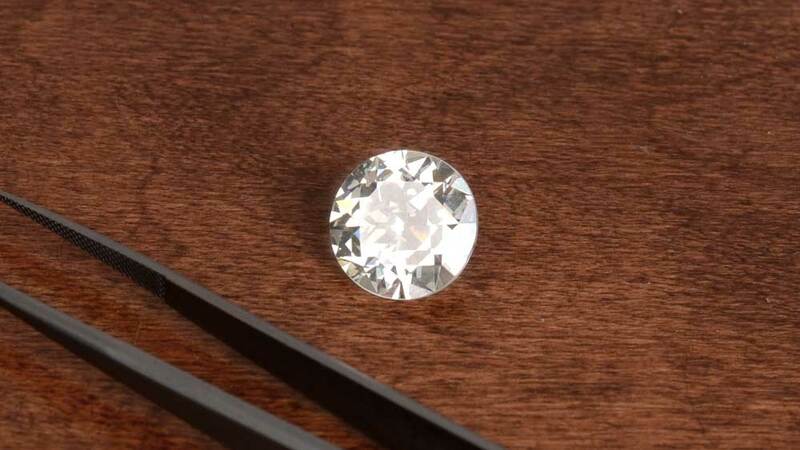 Moissanite, although considered a diamond substitute is actually usually quite a way down the diamond color scale. Some moissanite-stones are close to the D color end of the scale, but most are around I-K in color. This, in addition to their lack of rarity, makes them less desirable for setting as a replacement for diamonds. Cubic Zirconia is almost always both colorless and flawless which, in theory, should make it an ideal substitute for diamonds. The material, however, carries nothing of the fire and brilliance of a natural diamond. Although appearing visibly similar to most, CZ can be exposed as not being a diamond in seconds by a gemstone expert. The last common type of fake diamond is flint glass, commonly known as “paste”. Paste stones are designed for decorative jewelry and decoration. They were not manufactured as an actual diamond substitute. In spite of their differences to diamonds, attempts are still sometimes made to pass them off as diamonds. In short, a paste is really no more than hand-cut glass. It would fail all the standard tests for establishing the quality of a diamond. As a buyer, there are a few large warnings that should trigger you to suspicion. These warnings won’t tell you that the diamond is fake, but rather should spur you to investigate. If a diamond is valued at a level which seems too good to be true, it almost certainly will be. Even assuming it isn’t fake, and appears to be of good color and clarity, a suspiciously cheap price will often mean the diamond is stolen which brings more problems than you’ll ever want to encounter. Either way, diamond values are easily searchable on the internet, so as long as you can establish the 4Cs of the stone, you can quickly assess the approximate value. If it is significantly lower than the going rate, walk away. How to Authenticate a Diamond? This is where things get a little more complicated. It should only take a little effort to establish whether your prized diamond ring is all it should be. It should be noted, however, that none of these tests are sufficient in themselves to establish the authenticity of a diamond. 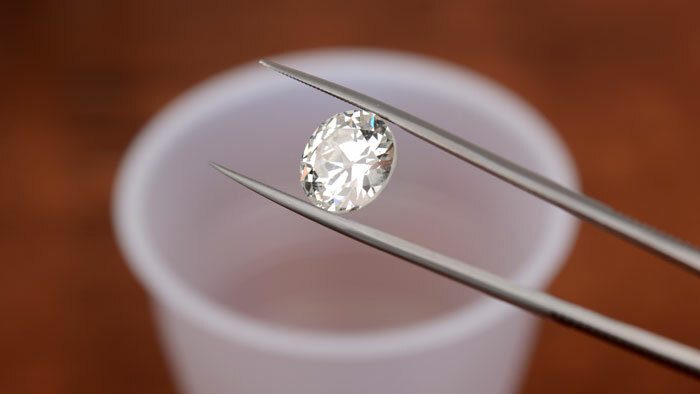 Moissanite, in particular, has many similar properties to natural diamonds and will pass many of these tests. Diamonds are extremely effective at conducting heat which, along with their hardness, is why they are very suitable for industrial cutting processes. Fake materials like CZ and glass are actually quite poor conductors of heat, and so a simple test will give you some idea as to whether you have a diamond or an imitation. Any material will, generally, be either a conductor of heat or an insulator. Diamond is a conductor, whereas most imitation materials are insulators. Make sure your diamond is at room temperature and breath on it. If the light misting dissipates immediately, it is likely to be a diamond. It is very likely a fake if the misting takes a second or two to disappear. Have you ever breathed on a window and written your name? 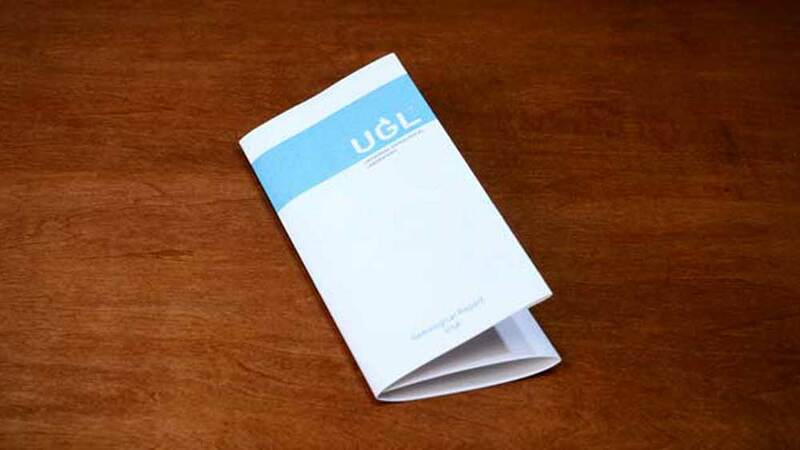 You’ll see the principle at work as the glass is an insulator of heat, and a poor conductor. This diamond test is the same thing, but just on a smaller scale. CZ is, basically, a type of glass, and doesn’t have the refractive properties of a diamond, and the same goes for all other imitation stones. 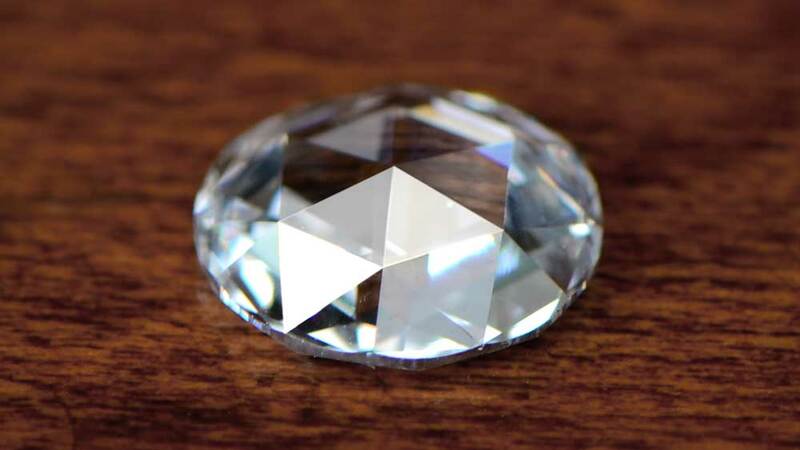 If you are able to lie the diamond sufficiently flat on a newspaper and can ensure sufficient light to see through it to the paper below, if you can read the print – even if it is blurry – then the stone is fake. 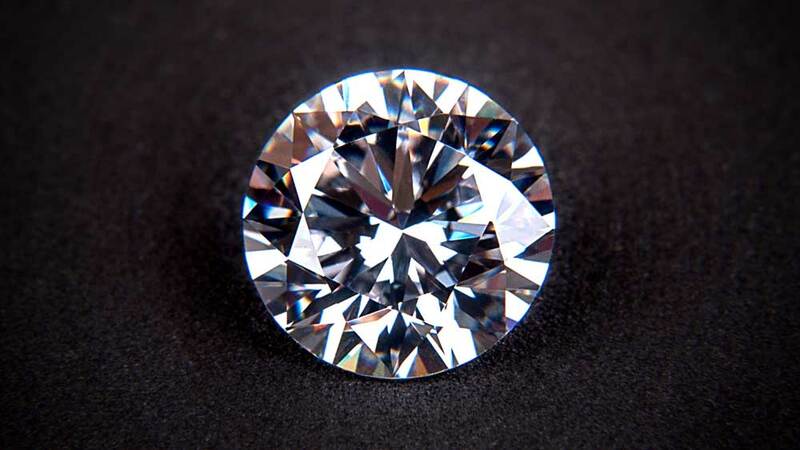 A natural diamond has such high refractive properties that the light is unable to travel through it on sufficiently straight a path so as to avoid extreme distortion. A true diamond will never allow the “read-through” effect seen with fakes. This test will only work with loose diamonds and is inappropriate for stones already in a setting. Get a glass of water and simply drop the diamond into it. Natural diamonds are extremely dense, and the stone will sink immediately. If your diamond doesn’t go straight to the bottom, then it isn’t a diamond, simple as that. Be aware that Moissanite is capable of replicating the sink effect, and so this test is really only good for establishing other materials. This test is again good for most fakes, but should only be undertaken with extreme care. Wear goggles and gloves to avoid potential injury. Please avoid this test altogether if you are not comfortable with it. Diamonds don’t care about extreme heat, unlike most materials. 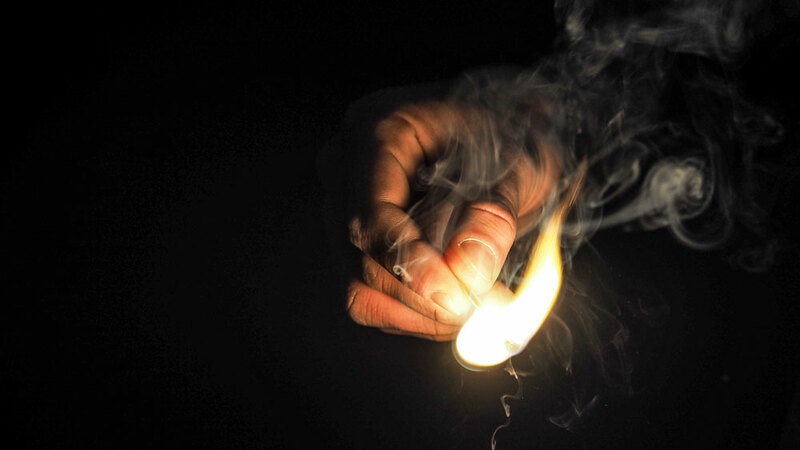 With fireproof gloves and a pair of pliers, grip the stone tightly and expose it to a lighter or another flame for about 45 seconds. Drop the heated stone into a glass of cold water and, if the stone fractures or shatters, it is not a diamond. If no reaction is seen, then the diamond is genuine. There are many tests to check the authenticity of a diamond, particularly when establishing whether your diamond is actually Moissanite which is notoriously good at displaying itself as a diamond. If you have done one or more of the above tests and have reached the conclusion that your diamond isn’t Cubic Zirconia or plain old glass, but you’re still not 100% sure, ask a jeweler to test the stone properly. Most tests aren’t particularly expensive and are worth it for your own peace of mind. Provenance is a great way of knowing if your diamond is real but, if it isn’t available, then a certificate of appraisal is the next best thing. If all else fails, the tests above may help to eliminate some doubts, but a professional assessment will always be the ultimate way to check if your diamond is natural or imitation. And isn’t peace of mind worth it?